I knew it would take a special topic to get me blogging again, and this one is as good as it gets. For the record, I have been an unapologetic Lance Lynn fan since his days with the Springfield Cardinals, way back in 2009. He went 11-4 that year with an ERA just under 3 runs per game – in a very hitter friendly league and park. The question of what to do about Lance Lynn brings out all sorts of responses, but they tend to fall into one of three categories. Let’s look at each and try to figure out what the right answer is. I believe this is the stance from one of my favorite bloggers and sports buddies, Bill Ivie. We have had many fun conversations about Kyle Lohse over the years, and this feels very much like one of those, for a number of reasons. Let’s start with the pro side of the argument. There is no question that Lance Lynn’s value has never been higher. In spite of posting records of 18-7 and 15-10 in his first two seasons as a starter, there still seems to be some lingering doubt about how much of that was Lance Lynn and how much was the Cardinals offense blowing out opponents in his starts. Some of those critics were silenced with another 15-10 record last year where the big guy shaved more than a run off his ERA, while others will point to his relatively unchanged FIP, suggesting he was just more lucky than actually good. Perhaps more important than his wins and losses, Lynn has now gone back to back seasons with 200 or more innings pitched. He pitched into the seventh inning in 14 of his 33 starts last year, including two complete games (one was a shutout). The last Cardinals pitcher to have back to back 200 inning seasons, not named Adam Wainwright, is Chris Carpenter (2010-2011). You have to go back to 2005 to find another name, and that was Jason Marquis. No, really. While all of this Lynning stuff might make for fun debate on Twitter or one of the various message boards, it really doesn’t matter. The con side won this debate on Nov 17. 2014. That was the day Shelby Miller was traded to the Atlanta Braves for Jason Heyward. The depth of the Cardinals rotation, once an almost embarrassing abundance, was impacted significantly by this deal. So much so that Lance Lynn becomes nearly untouchable. He is now one of the veterans in spite of just entering his first year of salary arbitration. Even with the rumors of the Cardinals pursuing big name pitchers, such as Cole Hamels, Max Scherzer and David Price, those are all about adding depth to supplement the existing rotation, not to replace any of the core members (Adam Wainwright, Lance Lynn, Michael Wacha). Shelby Miller’s departure just means you can write Lance Lynn’s name in to the Cardinals 2015 rotation in ink, not pencil. This should be a non-starter for a number of reasons, the foremost being that the Cardinals want to avoid salary arbitration at nearly all cost. On one hand, it is a contentious process that the front office views as destructive to the relationship they have worked so long and hard to build with a young player. It sends a message that the player is not a core member of the roster, but a commodity. That is a sure way to push a player, such as Lance Lynn, into testing the free agency market at their first opportunity. Another risk for the front office is lack of salary control in subsequent years. The two sides could enter the process next year, differing by millions of dollars, dollars that the team would much rather spend courting new free agents early in the next signing period instead of holding in reserve should they lose in arbitration. If that is not enough, there is even more risk on Lance Lynn’s side of this negotiation. While he has made steady improvement in his first four seasons, he is also one pitch away from a season or career ending injury. While fans may dismiss this rather quickly, this is Lynn’s career and he has an opportunity right now to guarantee a lifestyle for his family that many fans can only dream about. This is ultimately the right answer, though opinions on “how long” and for “how much” vary significantly. Fortunately we have some examples in recent Cardinals history that should help us sort this out. Just before the start of the 2008 season, Adam Wainwright signed a 4 year $15M deal. It was structured as $750k signing bonus, $500K (2008), $2.6M (2009), $4.65M (2010) and $6.5M (2012). It also included options for 2013 and 2013, valued at $9M and $12M respectively. This was for a former first round draft pick (Braves, 2000) that had lived up to and probably surpassed many expectations. In other words, Adam Wainwright was seen as a future top-of-the-rotation-face-of-the-franchise guy. 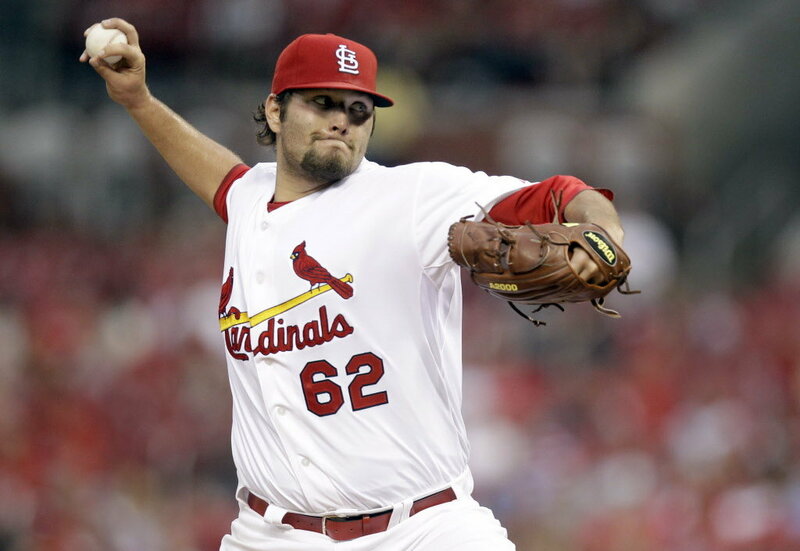 Midway though the 2011 season, Jaime Garcia signed a 4 year $27M deal. Like Adam Wainwright’s, it bought out his last team controlled year as well as all of his arbitration eligible time. It was structured as a $500k signing bonus, $3.25M (2012), $5.75M (2013), $7.75M (2014) and $9.25M (2015). It also included two option years at $11.5M and $12M, respectively. At the time of the signing, Jaime Garcia was 10-5 with a 3.14 ERA after a rookie season where he went 13-8 with a 2.70 ERA and finished third in Rookie of the Year voting. In other words, he was the left handed young stud to pitch alongside Adam Wainwright for the foreseeable future. For the risks the Cardinals took in both of these deals, they were rewarded with what turned out to be discounts later in the later (free agent) years as salaries escalated pretty quickly, thanks to some gargantuan deals elsewhere. The players got some security, which turned out to be bigger benefits than the team discount as both missed significant playing time. Given where Lance Lynn is today, these two deals should serve as something of a floor for a forward looking deal, for two reasons. First, and most significant, all of the years in a potential long term contract will be at arbitration rates, not the league minimums where Garcia and Wainwright started. The other factor is overall rise of salaries in the major leagues, which makes Adam Wainwright’s 2008 deal look like a huge bargain. The ceiling for such a deal could be Kyle Lohse’s contract from the end of the 2008 season. In his case, he was already a free agent thus his contract extension reflected that escalated yearly salary. He signed a 4 year $41M extension which was split out as a $1.25M signing bonus and $7.125M (2009), $8.875M (2010), $11.875M (2011) and $11.875M (2012). Lohse is a particularly interesting case as he went to arbitration in his first two eligible seasons with Minnesota, winning both times. He was traded to Cincinnati in the last of those as the two were unlikely to work out any long term deal. That is not how the Cardinals would want to proceed with Lance Lynn, especially now with Shelby Miller in Atlanta and Michael Wacha not anywhere close to 150 innings, let alone the 200 mark that Lynn has turned in the last two years. Any deal that the Cardinals make with Lance Lynn, other than a year at a time, will buy out all three years of arbitration. In order to get something of a discount to compensate for their risks, it should also include his first year of free agency, some of which can be front loaded as an incentive. Going beyond that, remembering that Adam Wainwright just signed a 5 year extension, would be in the way of options, protecting both parties. Using the Lohse and Garcia deals as bookends, you get something that might look like $1M signing bonus, $5M (2015), $7M (2016), $9M (2017) and $14M (2018). Adjusted for salary differences, this is not all that far off Adam Wainwright’s deal back in 2008. This would provide an incentive up front while not blowing out any arbitration comparisons for the next round of pitchers that will go through the process. What will they actually do ? Time will tell, but I wouldn’t be surprised at all if Lance Lynn and the Cardinals announce a 4 year contract in the vicinity of $36M in the next few days. What would you do ? Please share your ideas in the comments. Thanks for reading. Go Cardinals. ps: All contract information is courtesy of Cot’s Baseball Contracts. This entry was posted in 2015 Season and tagged Adam Wainwright, arbitration, cardinals, Chris Carpenter, free agency, jason marquis, Lance Lynn, salary, Shelby Miller, st. louis, stlcards. Bookmark the permalink. 5 Responses to What to do about Lance Lynn ? Excellent analysis Mr. Netherton…need more posts from you again. I say we sign him! $20M or so should do it. Pingback: Lance Lynn inks new deal. « The view from here.